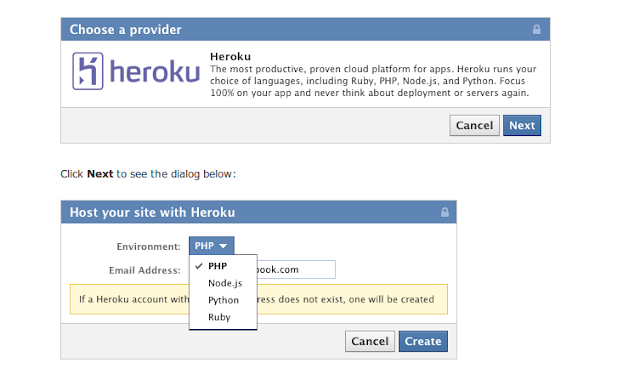 Cat Lee of facebook wrote on the facbook blog in an article titled "Facebook and Heroku: an even easier way to get started" wrote "We continue to make it even easier to get started building apps on Facebook Platform. We know that one of the most difficult things to getting started is setting up a place to host your app. As a result, we are starting to partner with some of the top cloud service providers to make it simpler for you to have your first app up and running in a few clicks -- all from within the Dev App. " This is definitely seen as a move by facebook to grab the attention from the developers as Google+ is going to release their full version API shortly. This seems to be strategic move by Zuckerberg. But what needs to be seen will it be a master move or just another attempt. What is interesting is recently Google hiked the prices of the Google App Enigne, which came as a surpise to many developers. Programming languages supported : Php, node.js, Ruby and Python. All open source programming languages.